Two strangers’ lives are thrown together when their unintentional one-night stand causes the mousy but friendly, Kim Mi-young, to become pregnant with the arrogant and wealthy Lee Gun’s baby. With nothing in common, the two people must quickly learn about the other when they are forced to get married. Lee Gun’s girlfriend certainly won’t be making things easy for the couple when she finds out about her long-time boyfriend marrying a stranger and having a baby. Mi-young and Lee Gun seemed to have met under the strangest and most random of circumstances, but perhaps things happened exactly the way they were supposed to. Having just finished watching and loving the original Taiwanese version of Fated to Love You, I had some pretty high hopes and standards for the 2014 Korean remake. While watching the first episode, I couldn’t help but compare every little thing with the Taiwanese one. It might be a little unfair to do that and not view this drama as its own, but any remake of a popular show or movie is going to be judged more critically. 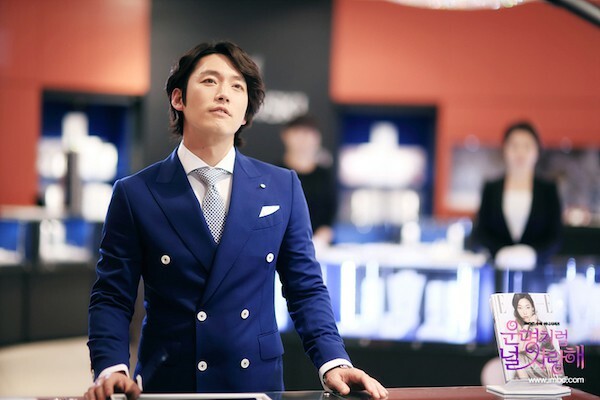 The Korean version of Fated is most definitely a kdrama, in both its aesthetic and acting style, and no one is going to mistake it for the Taiwanese one. Because this is only a remake and not a carbon copy of the original drama, there were a few things that were changed here and there that could alter some future plotlines, steering it slightly away from the plot layout of the Taiwanese version. The biggest problem that I had with this drama was its speed, or lack thereof. Because I already know the story of Fated, I was frustrated that the writing for the Korean version would drag out and emphasize unimportant things, but then quickly glance over major plot developments. Since this story is about Kim Mi-young and Lee Gun’s relationship AFTER their one-night stand, it would make sense to not prolong their meeting process beforehand. Honestly, I felt that this episode was a complete waste, plot-wise. There was nothing that happened in the entire hour that couldn’t have been explained in the first 10, maybe even 5, minutes of it. Why waste the audience and the characters’ time in trying to make every single thing fluffy and cute, but ultimately without substance? One of the things I appreciated in the original Fated was how they used the one-night stand and baby as means for getting the characters together, and then letting their relationship develop on its own from that. The one-night stand plot is important, but not so much that it warrants an entire episode. At this rate, we aren’t going to learn about Mi-young’s pregnancy until episode 5, since they still haven’t slept together yet in this episode. This version of Fated is spending way too long setting up for the one-night stand, and trying to get the audience to know the characters, their motivations, emotions, favorite color, favorite snack, etc. Instead of helping me become invested in the characters and their story, it’s actually pushing me away because right now, I couldn’t care less about any of those things. Why would I want to know about two random strangers? I want to learn these things after Mi-young and Lee Gun are together, not before. If the Korean Fated is able to pick up the speed and not dwell on the pointless things, it has potential to be a charming drama that more closely resembles the Taiwanese one. As of now, I’m not holding out too much hope for this to even come close to the depth of the original version. What made the original drama so great was how it took a contrived plotline and made it something that seemed completely realistic and natural. So far, this drama is not giving any indications that it will be able to accomplish that. I’ll probably watch episode 2, mostly because I’m such a big fan of the original Fated that I want to see this story play out. This version has the ability to be a cute and fun drama, but it’s going to have to be a lot better to be a great one. Ethan Ruan and Joe Chen starred in the leading roles in the 2008 Taiwanese version of Fated to Love You. Jang Hyuk and Jang Na-ra previously starred together in the 2002 drama, Successful Story of a Bright Girl. That drama was then remade into the 2010 Taiwanese drama, Sunny Girl, starring Rainie Yang and Wu Zun. 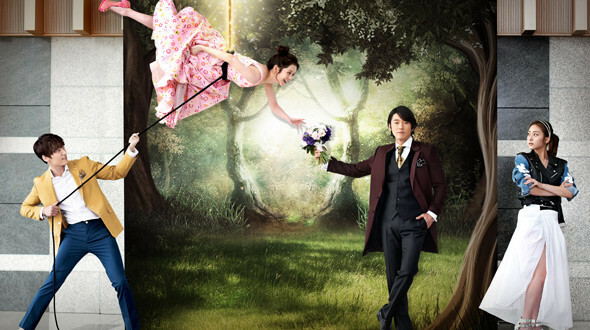 Read the review on the Taiwanese drama, Fated to Love You! I’m actually ok with the hair. It is an upgrade from LMH’s hair in BOF! I also thought the first 2 episodes were forgettable. I’m not sure if I just loved the original too much, But you’re right, the production and writing team spent too much time on the setup to the one-night stand, when they should’ve just jumped right in for a change, and then do a quick flashback to establish character motivation. The only thing that made me pause and pay attention was the scene when LG was asking Miyoung why she insisted on getting the earrings back, and she said: “because these are mine!”. Oh well, i think i’m gonna be doing another round of rewatch..
dongwookie — at least you finished the first two episodes! i told Anna that i got through 20 minutes and then went to sleep because it was too boring 😦 what a disappointment! You really need to go back and watch the drama and don’t give up so quickly. I have seen the T-Version too and loved it. But I love romance and this one has gotten good. I really love this drama I have seen the t-version and I can appreciate that this is not the same. I have enjoyed every series. The lead actor is so comedic and the lead actress has just the right touch. I am glad that this is not just a remake of the original version even though I loved it. Its watching these dramas and seeing how other writers can use the same title but come up with something new. I am entertained every episode. I love how the snail has gotten into the blood stream up this guy and can’t wait for each episode. You can tell he is falling for her and has fallen big time. I just love the romance..
Evelyn from Nebraska — Hmm maybe I do need to give the Korean one another try. But I just loved the TW one so much that I can’t help but compare the two!